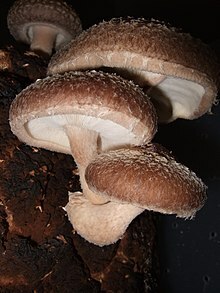 The shiitake (/ʃɪˈtɑːkeɪ, ˌʃiːɪ-, –ki/; Japanese: [ɕiːtake] ( listen) Lentinula edodes) is an edible mushroom native to East Asia, which is cultivated and consumed in many Asian countries. It is considered a medicinal mushroom in some forms of traditional medicine. The mushroom’s Japanese name shiitake (椎茸) is composed of shii (椎, shī, Castanopsis), for the tree Castanopsis cuspidata that provides the dead logs on which it is typically cultivated, and take (茸, “mushroom”). The specific epithet edodes is the Latin word for “edible”. It is also commonly called “sawtooth oak mushroom”, “black forest mushroom”, “black mushroom”, “golden oak mushroom”, or “oakwood mushroom”. Shiitake grow in groups on the decaying wood of deciduous trees, particularly shii, chestnut, oak, maple, beech, sweetgum, poplar, hornbeam, ironwood, mulberry, and chinquapin (Castanopsis spp.). Its natural distribution includes warm and moist climates in southeast Asia. The earliest written record of shiitake cultivation is seen in the Records of Longquan County (龍泉縣志) compiled by He Zhan (何澹) in 1209 during the Southern Song dynasty. The 185-word description of shiitake cultivation from that literature was later crossed-referenced many times and eventually adapted in a book by a Japanese horticulturist Satō Chūryō (佐藤中陵) in 1796, the first book on shiitake cultivation in Japan. The Japanese cultivated the mushroom by cutting shii trees with axes and placing the logs by trees that were already growing shiitake or contained shiitake spores. Before 1982, the Japan Islands’ variety of these mushrooms could only be grown in traditional locations using ancient methods. A 1982 report on the budding and growth of the Japanese variety revealed opportunities for commercial cultivation in the United States. Shiitake are now widely cultivated all over the world, and contribute about 25% of total yearly production of mushrooms. Commercially, shiitake mushrooms are typically grown in conditions similar to their natural environment on either artificial substrate or hardwood logs, such as oak. In a 100 gram amount, raw shiitake mushrooms provide 34 calories and are 90% water, 7% carbohydrates, 2% protein and less than 1% fat (table for raw mushrooms). Raw shiitake mushrooms are rich sources (20% or more of the Daily Value, DV) of B vitamins and contain moderate levels of some dietary minerals (table). When dried to about 10% water, the contents of numerous nutrients increase substantially. Like all mushrooms, shiitakes produce vitamin D2 upon exposure of their internal ergosterol to ultraviolet B (UVB) rays from sunlight or broadband UVB fluorescent tubes. Fresh and dried shiitake have many uses in the cuisines of East Asia. In Japan, they are served in miso soup, used as the basis for a kind of vegetarian dashi, and as an ingredient in many steamed and simmered dishes. In Chinese cuisine, they are often sautéed in vegetarian dishes such as Buddha’s delight. One type of high-grade shiitake is called donko (冬菇) in Japanese and dōnggū in Chinese, literally “winter mushroom”. Another high-grade of mushroom is called huāgū (花菇) in Chinese, literally “flower mushroom”, which has a flower-like cracking pattern on the mushroom’s upper surface. Both of these are produced at lower temperatures. Basic research is ongoing to assess whether consumption of shiitake mushrooms affects disease properties, although no effect has been proven with sufficient human research to date. Rarely, consumption of raw or slightly cooked shiitake mushrooms may cause an allergic reaction called “shiitake dermatitis”, including an erythematous, micro-papular, streaky pruriginous rash that occurs all over the body including face and scalp, appearing about 24 hours after consumption, possibly worsening by sun exposure and disappearing after 3 to 21 days. This effect – presumably caused by the polysaccharide, lentinan – is more common in Asia but may be growing in occurrence in Europe as shiitake consumption increases. Thorough cooking may eliminate the allergenicity. There is research investigating the use of shiitake mushrooms in production of organic fertilizer and compost from hardwood. ^ Berkeley MJ. (1877). “Enumeration of the fungi collected during the Expedition of H.M.S. ‘Challenger’, 1874–75. (Third notice)”. Botanical Journal of the Linnean Society. 16 (89): 38–54. doi:10.1111/j.1095-8339.1877.tb00170.x. ^ Pegler D. (1975). “The classification of the genus Lentinus Fr. (Basidiomycota)”. Kavaka. 3: 11–20. ^ “GSD Species Synonymy: Lentinula edodes (Berk.) Pegler”. Species Fungorum. CAB International. Retrieved 2015-03-09. ^ a b Wasser S. (2004). “Shiitake (Lentinula edodes)”. In Coates PM; Blackman M; Cragg GM; White JD; Moss J; Levine MA. Encyclopedia of Dietary Supplements. CRC Press. pp. 653–64. ISBN 978-0-8247-5504-1. ^ Halpern GM. (2007). Healing Mushrooms. Square One Publishers. p. 48. ISBN 978-0-7570-0196-3. ^ 香菇简介 [Mushroom Introduction] (in Chinese). Yuwang jituan. Archived from the original on 25 February 2017. ^ Miles PG; Chang S-T. (2004). Mushrooms: Cultivation, Nutritional Value, Medicinal Effect, and Environmental Impact. CRC Press. p. 241. ISBN 978-0-203-49208-6. ^ Tilak, Shantanu (2019). “The Shiitake Mushroom-A History in Magic & Folklore” (PDF). The Mycophile. Vol. 59 no. 1. pp. 1, 4. Archived (PDF) from the original on 5 February 2019. ^ Przybylowicz, Paul; Donoghue, John (1988). Shiitake Growers Handbook: The Art and Science of Mushroom Cultivation. Dubuque, Iowa: Kendall/Hunt. pp. 3–6. ISBN 978-0-8403-4962-0. ^ a b Leatham GF. (1982). “Cultivation of shiitake, the Japanese forest mushroom, on logs: A potential industry for the United States” (PDF). Forest Products Journal. 32 (8): 29–35. ^ a b c Vane CH. (2003). “Monitoring decay of black gum wood (Nyssa sylvatica) during growth of the Shiitake mushroom (Lentinula edodes) using diffuse reflectance infrared spectroscopy”. Applied Spectroscopy. 57 (5): 514–517. doi:10.1366/000370203321666515. PMID 14658675. ^ a b Vane CH; Drage TC; Snape CE. (2003). “Biodegradation of oak (Quercus alba) wood during growth of the Shiitake mushroom (Lentinula edodes): A molecular approach”. Journal of Agricultural and Food Chemistry. 51 (4): 947–956. doi:10.1021/jf020932h. PMID 12568554. ^ Bowerman, Susan (31 March 2008). “If mushrooms see the light”. Los Angeles Times. ^ Ko JA; Lee BH; Lee JS; Park HJ. (2008). “Effect of UV-B exposure on the concentration of vitamin D2 in sliced shiitake mushroom (Lentinus edodes) and white button mushroom (Agaricus bisporus)”. J Agric Food Chem. 50 (10): 3671–3674. doi:10.1021/jf073398s. PMID 18442245. ^ hang TS; Hayes WA. (2013). The Biology and Cultivation of Edible Mushrooms. Elsevier Science. p. 470. ISBN 978-1-4832-7114-9. ^ Nakano H; Namatame K; Nemoto H; Motohashi H; Nishiyama K; Kumada K. (1999). “A multi-institutional prospective study of lentinan in advanced gastric cancer patients with unresectable and recurrent diseases: effect on prolongation of survival and improvement of quality of life. Kanagawa Lentinan Research Group”. Hepato-gastroenterology. 46 (28): 2662–8. PMID 10522061. ^ Oba K; Kobayashi M; Matsui T; Kodera Y; Sakamoto J. (2009). “Individual patient based meta-analysis of lentinan for unresectable/recurrent gastric cancer”. Anticancer Research. 29 (7): 2739–45. PMID 19596954. ^ Bisen PS; Baghel RK; Sanodiya BS; Thakur GS; Prasad GB. (2010). “Lentinus edodes: a macrofungus with pharmacological activities”. Current Medicinal Chemistry. 17 (22): 2419–30. doi:10.2174/092986710791698495. PMID 20491636. ^ “Shiitake mushroom”. WebMD. 2015. Retrieved 5 March 2015. ^ a b c Boels D; Landreau A; Bruneau C; Garnier R; Pulce C; Labadie M; de Haro L; Harry P. (2014). “Shiitake dermatitis recorded by French Poison Control Centers – New case series with clinical observations”. Clinical Toxicology. 52 (6): 625–8. doi:10.3109/15563650.2014.923905. PMID 24940644. ^ Hérault M; Waton J; Bursztejn AC; Schmutz JL; Barbaud A. (2010). “Shiitake dermatitis now occurs in France”. Annales de Dermatologie et de Vénéréologie. 137 (4): 290–3. doi:10.1016/j.annder.2010.02.007. PMID 20417363. ^ Welbaum GE. (2015). Vegetable Production and Practices. CAB International. p. 445. ISBN 978-1-78064-534-6. Stamets, P. (2000). Growing Gourmet and Medicinal Mushrooms (3rd ed.). Berkeley, California: Ten Speed Press. ISBN 978-1-58008-175-7. Tsuji, Shizuo (1980). Japanese Cooking: A Simple Art. New York: Kodansha International/USA. Lindequist, U.; Niedermeyer, T.H.J. ; Jülich, W.D. (2005). “The pharmacological potential of mushrooms”. Evid Based Complement Alternat Med. 2 (3): 285–99. doi:10.1093/ecam/neh107. PMC 1193547. PMID 16136207.